The ideal egg is a fresh egg with a clean and smooth brown or white shell, a pure deep-yellow yolk, and translucent, firm white. The following documents deal with egg production and quality. EggInvest is a Microsoft Excel® spreadsheet designed to assist in the preliminary investigation of future investment in egg production. EggInvest is not intended as a final decision making tool. It has been designed to only indicate those options which warrant further detailed investigations. Users can adjust Lay Rate, Egg Weight, Feed Intake and Mortality from a selection of standard productions curves to reflect the proposed production system. The EggInvest Production Simulator uses this data to predict hen numbers, egg production, egg weights and feed consumption for a 20 year period. 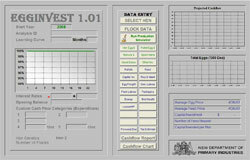 EggInvest can simulate production for up to 20 different sheds or flocks. This information is combined with financial budget data to develop a predicted cashflow and determine a payback period for the investment.